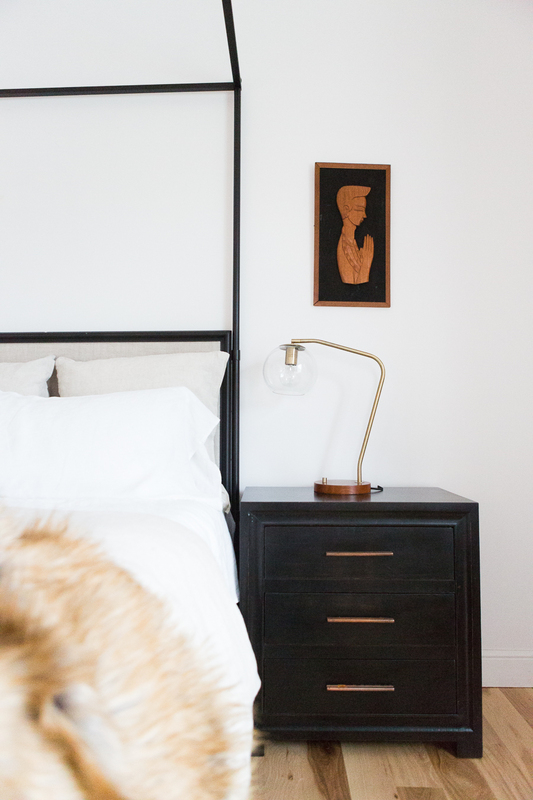 Marriage is all about compromise y’all, which is why I’ve decided I’m going to write this blog post on 5 Tips for Creating a Master Bedroom he will love too. Because you know what, I love Mike Miller. And I know that when I go with a pink rug and crushed navy velvet chairs and leopard pillows in the living room, that it’s too much to also ask him to go that glam in the bedroom too. So, I’ve tried to go a bit more masculine in the master bedroom and create a space that reflects his style as well. 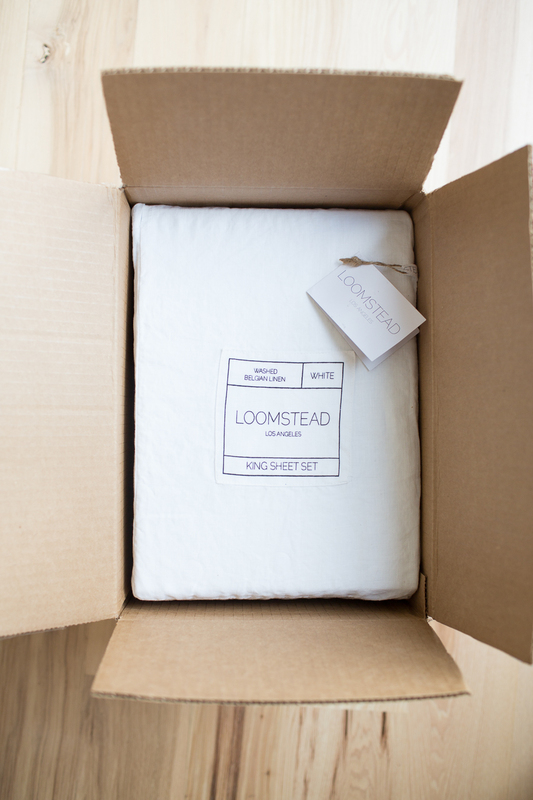 I’m so thankful to partner with Loomstead Linen bedding for this master bedroom refresh and if you haven’t check them out, their bedding is amazing. I’ve never had linen sheets or bedding before but I am in heaven with this bedding and I love the minimalist look and how it pairs so nicely with the canopy bed. 1. Consider Trying a Canopy Bed – When we were building and designing our current home, I decided I wanted a canopy bed for our master. I have absolutely loved it and I think it adds a perfect touch of masculinity but can be paired with the right bedding and pillows to add a touch of femininity if you want. 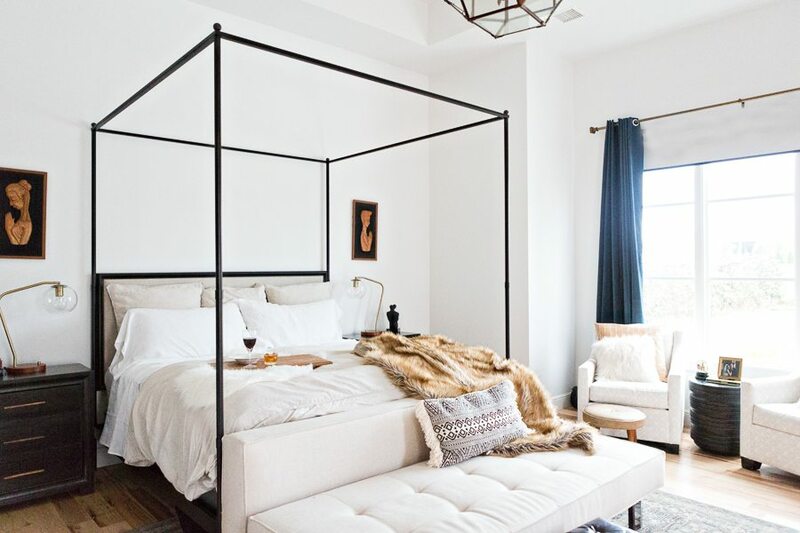 Here are my favorite canopy beds sourced from $400 beds on up. Trust me you won’t regret choosing a canopy bed for your master and your husband will love the look too! 2. Consider Using a Light Fixture – I think our caged pendant in our bedroom adds a touch of masculinity but also interest that I find aesthetically pleasing. I’ve heard it said that light fixtures are the jewelry of the home, and I completely agree. You know how you can wear a plain, black t-shirt and it’s just casual, but if you put the right jewelry with it — you have an outfit for a night out on the town. Lighting does that for a bedroom. It can completely take it up a notch as far as design. Here are some pendant light fixtures that could be used in your bedroom that I think your husband will love as well. Also, one of the main questions I get asked about with our bedroom is where our daybed and nightstands and rug are from. 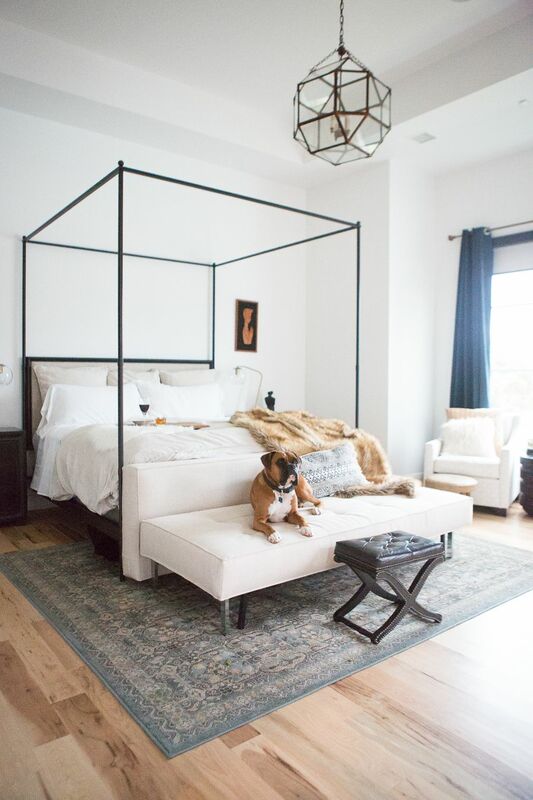 They all were sourced locally and are no longer available but here is a very similar daybed from West Elm and some nightstands and a rug I would recommend if you are wanting to achieve this look. 3. Use a desk or a task lamp – I just recently added this little lamp to our master bedroom and I think it is perfect for the space. A lamp can do a lot for a bedroom and if I were to add a more feminine lamp, it would change the look of the room. I like adding a desk lamp or a task lamp for a little touch of masculinity. I’ve used desk lamps for both my teenage son’s room and our room. Here are some of my favorites. 4. 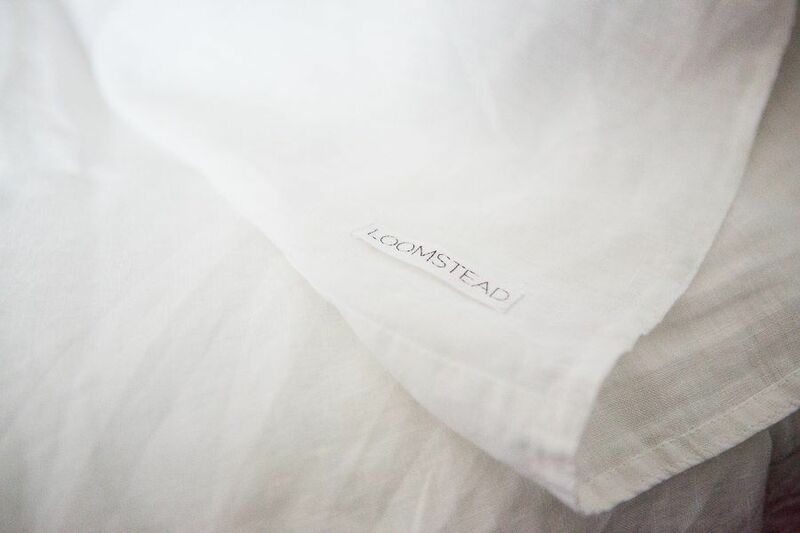 Linen Bedding – I recently switched my bedding to linen bedding from Loomstead and I love the simple, textured and clean look it provides in the master bedroom and so does Mike Miller, so it’s a win win for him and for her! Oscar is super frustrated that we don’t allow him on our new linen bedding by the way. 5. Consider a Gallery Wall – I think the art you use in your Master Bedroom can be a nice touch to create a space your husband will love. Here is a picture from our Fall Home Tour that shows you our entire gallery wall in our master. I think it’s a look that both of us love. All of these prints are available in our print shop and I’m also sourcing some great frames for you as well. Our longhorn print and buffalo print also look great in the master bedroom above the bed or on a statement wall. Hope this post gives you some ideas for how to create a master bedroom that both of you will love. Don’t forget to check out pillows from Little Design Co (my velvet pillows and fur bolster are from her shop) and here are some of my other favorites from our bedroom – we love the daybed at the base of our bed and I also love to incorporate leather and fur in our master bedroom. Seriously though, I bought Linen Sheets about 2 months ago for my wife because she was complaining about the heat and I dont think I’ve ever slept so comfortably (and not sweaty). If I knew they could have made that much of a difference, I definitely would have made the leap sooner. They are amazing! We absolutely love ours! I love your bed! It doesn’t look like any of the options on your site are your bed — which one do you have? Mine is crom restoration hardware but I can’t link to it. I think they still have it though! Your nightstands are absolutely perfect! Where did you get yours from? -Thanks! Just have to tell you that my name is Carissa and I’m married to a Mike also! So funny! My husband really wants a ceiling fan in our bedroom. Any stylish tips for a fan that still looks good? Hi! Your bedroom is beautiful!!! I have a bed and nightstands similar to yours… and I’m STRUGGLING picking dressers! I don’t think I want black. Any tips?? If you search for other Master bedroom posts on my blog, I have several options sourced – a mirrored dresser and a wood one that I love! Hello! I noticed that the pillows and sheets are different colors. I know it is white and I cant tell if it is taupe, natural or light grey. Thanks! 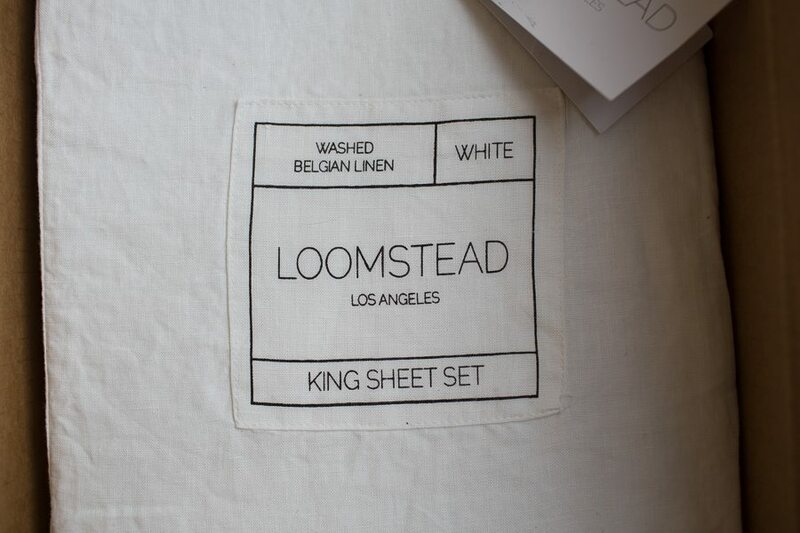 The linen bedding is from Loomstead and it is a very very light grey/taupe color, almost white. Hope that helps! Love the daybed! Where can I find it? Hi Jenn! I just updated the post and included a link to an almost identical daybed. Hope that helps! Hi! Any chance you can share where you got your exact rug? Thanks! Hi, You’re room is amazing!!! I was wondering where did you get the his and hers namaste art? They were a thrift store score!